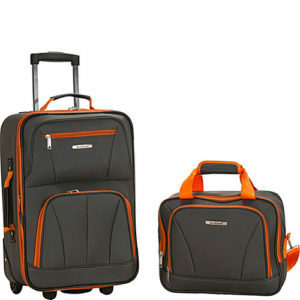 This is the two piece luggage set from Rockland. 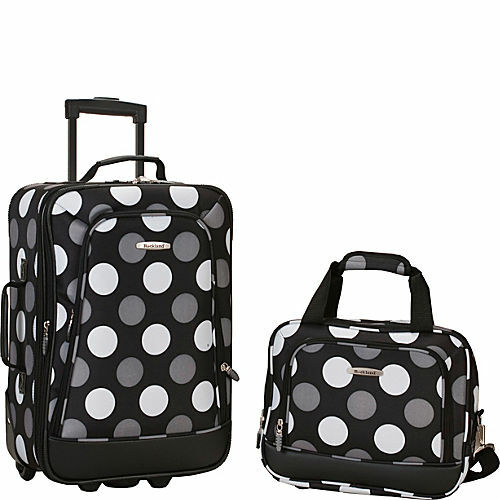 This luggage set is one of the best-selling luggage sets and I can see why. I love the designs that are offered and how it’s perfect for flying and as such it was a pleasure to test drive. As always with luggage sets, I will review its style, durability and functionality and let you know if this may be the right piece of luggage for you. But for the price of this luggage set, I’m surprised that not everybody has this as it’s a perfect weekend getaway luggage set. On to the review so I can finally stop writing for today! The Rockland two piece luggage set definitely has some appeal as they offer many unique designs and colors to choose from. Overall they have 36 different designs for you to choose from and each one has its own unique personality. The one I’m reviewing today is called Charcoal. It has a grey main exterior and orange zipper outlines and stitching, along with orange straps and handles. You can see to the right here what this luggage set looks like. This Rockland two piece luggage set has many options available and is a perfect gift for that new college grad or even for your children. It is also ideal for someone who is just taking a short weekend vacation or on the road for work. 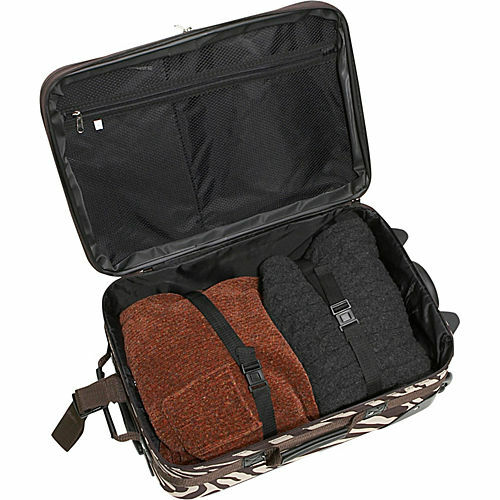 It’s perfect for both men and women and I really enjoy traveling with this set as it’s very stylish. 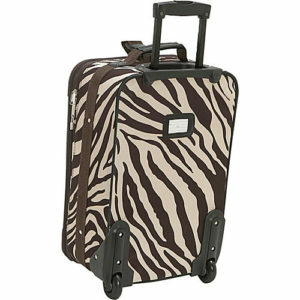 Lastly, I know some people want to know what their luggage is made from and this one is made with 100% polyester. 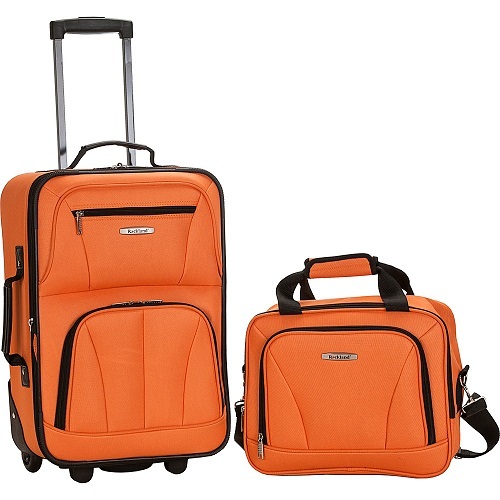 The design of the luggage set structurally as well as the number of different options available for the colors makes this a great choice for many people and I give its style, 5 out of 5 stars! Now while the Rockland two piece luggage set may be ideal for students or business professionals for weekend travel, it’s not ideal for anything much longer or more frequent than that. It’s not designed to be a road warrior of luggage. If you’re considering this luggage set then take note that you may want to buy TSA approved locks separately as the ones that come with this baggage set are useless. The additional locks maybe cost only four dollars so it’s not that big of an issue. If you don’t worry or don’t care about locking your luggage then this should be a non-issue for you. I noticed that after really abusing this bag after a few trips that the zippers and stitching seemed to start giving way. The zippers feel like they could be ripped off if you aren’t too careful with them. The stitching isn’t that bad but I did notice a few strands here and there that I just clipped. So far I haven’t had any serious issues but again I am purposely rough with luggage to get an idea of how well it will hold up. The Rockland two piece luggage set is a good choice for weekend trips or overnighters but not consistently, as the durability of this piece of travel gear will start to come into question. If you’re looking for something durable and/or more full size, check out the Samsonite Tread Lite Set. After being very rough with this gear, you can kind of see its weaknesses start to show but if you’re not planning on being a savage with it then this should suit you just fine. For these reasons I will give the Rockland two piece luggage set a rating of 4 out of 5 stars for durability. The Rockland two piece luggage set is a perfect short trip, weekend kind of luggage set. It definitely gets the job done and it’s great for packing light and getting on the road or even for flying as it’s the perfect luggage for avoiding baggage fees. This isn’t your traditional luggage set with a full suitcase and smaller carry-on, this one comes with a 19 inch upright carry-on and a 12 inch tote bag. You could store the larger one as a carry-on and make the tote your personal bag if you’d like. A feature that comes pretty much standard with all luggage sets these days is the ability for it to expand so you can pack more. 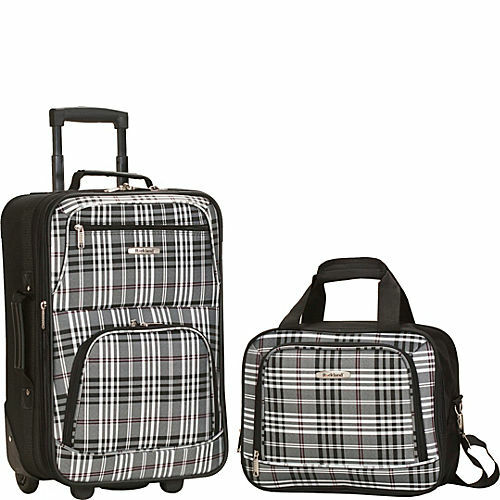 And as I’m sure you guessed; this Rockland two piece luggage set comes with that same feature. You can also find some other common features of other luggage sets with this one as well. 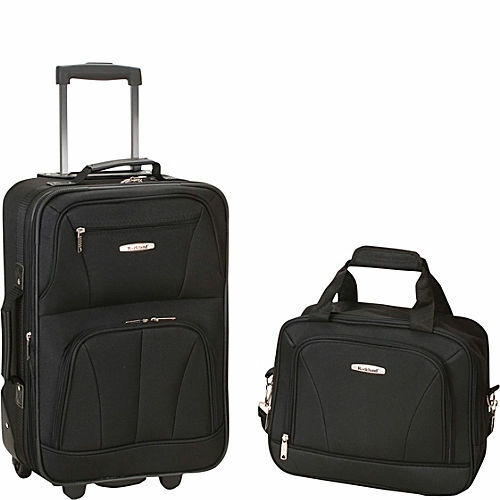 The carry-on suitcase comes with an inside retractable handle that you can use to pull or push your luggage around. It also has grips on the top and side of the suitcase to easily handle it while throwing it on convey belts, in your truck, whatever it may be. The inside of the larger suitcase has a zippered mesh pocket that you would expect in any piece of luggage. On the outside you will find that it has two pockets on the front side that are a nice size to store travel documents, phone charger or other small accessories. Or if you want to be like me, you can just stuff your dirty clothes in there and deal with it when you get back home to do laundry! Finally the other common features are the in-line skate wheels so you don’t have to actually carry your luggage around, who does that anymore? And stabilizing feet on the bottom that are meant to hold your luggage upright once it is loaded. However I have an issue with this part of the luggage. Unfortunately the boneheads at Rockland decided the feet needed to be shorter and as such, when you have your suitcase fully loaded, it will tend to fall forward if you have too much in there. The only way around this is the make sure it faces a wall. With all of this taken into account, I don’t find that small issue to be that big of a deal and it hardly detracts from the over greatness this Rockland luggage set has to offer. It comes with pretty much everything you would expect and taking into account the short feet on the bottom, I will give this set 4 out of 5 stars. The Rockland two piece luggage set is a pretty handy little set that anyone should consider getting. Its main bag is a carry-on size piece of luggage and it comes with a separate tote bag for toiletries or dirty clothes or whatever you want to use it for. 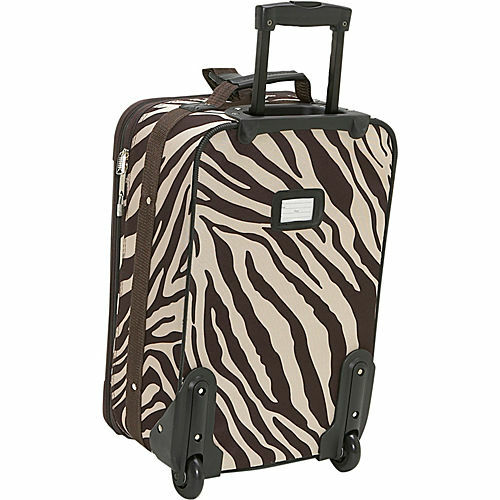 Rockland did a great job with the design of this luggage set as they offer it in 36 different variations of colors and designs. Again the version I reviewed is the Charcoal design that is grey with orange accents. They truly do have something for just about anybody’s personality so it is great for both men and women. The durability of the luggage set was fair, it did a great job of lasting while I was very rough with it but if you plan on this being your go to or main piece of luggage, I would reconsider it and choose something else. This is meant for weekend or short trips. The functionality of this bag is pretty much what you would expect on any piece of luggage today but we’re glad that Rockland has it. The only issue I ran into is the fact that the feet on the bottom tend to be a little short so the pack can end up falling over. With all of this taken into account and the exceptional price for this luggage set (it really is too good too pass up at this price range) I have to give the Rockland two piece luggage set 4.5 out of 5 stars. If you have this luggage set and want to review or comment please do so below!